Welcome Flyer for Happy Halloween party. イラスト素材: Welcome Flyer for Happy Halloween party. 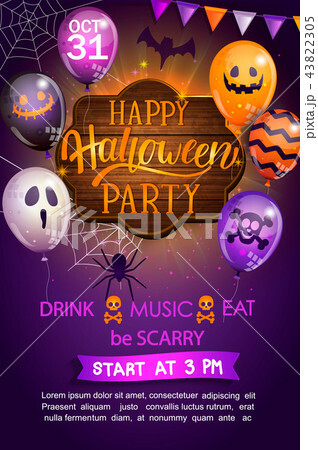 Welcome Flyer for Happy Halloween party with lettering on wooden board and monster balloons. Invitation and greeting card with spider and bat for web, poster, placard, banners. Vector illustration.